Many people don’t feel a part of their own family for a variety of reasons, whether it’s their political views, their sexual orientation, their commitment to a certain cause, or just because they don’t think their parents like them. The expression goes that you can choose your friends but you can’t choose your family, and for many this rings true since, given the option, they might opt to have nothing to do with those whose genes they share. In some cases, the loss of a family member can inspire an entirely new outlook on life, one which prompts an individual to make new connections and redefine themselves as something completely fresh. Nancy (Andrea Riseborough) is thirty-five years old, working as a temp, and living with her irritable mother (Ann Dowd), who is suffering from Parkinson’s disease. She dreams of being a writer but hasn’t found success, and instead writes a blog on the Internet about a miracle baby with which she’s become pregnant, inviting others to read her invented stories. 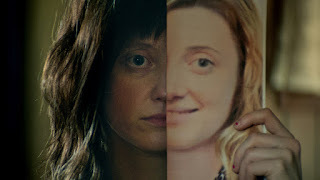 When her mother passes away, she latches on to a news broadcast showing two parents (J. Smith-Cameron and Steve Buscemi) still waiting for the return of their young daughter, lost thirty years ago, and, noting her resemblance to the doctored photo of the girl, reaches out to the family to try to reconnect with these people as their daughter. Nancy is a complex character, to be sure, one who interacts with the world in a way that doesn’t quite make it clear how she’s reacting to each situation. She’s difficult to read, and as a result her enthusiasm, which never affects the pitch of her voice or the expression on her face, about having parents who actually cared for her and hung on to the hope that they would see her again so many years later, can’t be deciphered, contributing to this film’s status as a mystery of sorts. When asked when she thought that her mother might have taken her from her another family, her answers are unconvincing, but that’s mostly because everything she says never really seems like she buys it. Riseborough, who stars in a whopping four Sundance films this year, including the far more entertaining “The Death of Stalin” opposite Buscemi, is a formidable actress capable of making pretty much any role interesting, but this isn’t her best work. 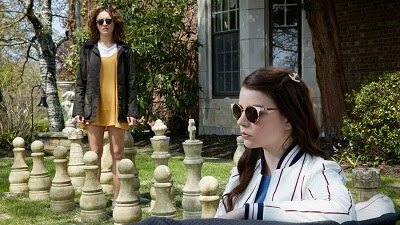 Like Nancy herself, something about this film doesn’t really feel genuine, and its receipt of a screenwriting prize is strange since this is among the weaker and less memorable entries in its competitive field. There are ideas and relationships to think about in this film, but its purposeful attempt to be unreadable and ambiguous is also its undoing.